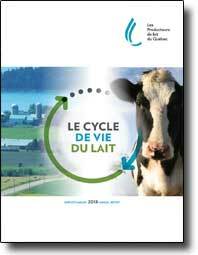 At its Annual General Meeting, Les Producteurs de lait du Québec (PLQ) presented Quebec’s results in the updated milk life cycle assessment (LCA) for Canada. In terms of carbon footprint, water consumption and land use, Quebec milk producers outperformed their 2011 levels. Ferme Denis Desfossés of Sainte-Brigitte-des-Saults, Ferme Beaux-Près enr. of Saint-Vianney, and Ferme Vicain SENC of Saint-Éphrem-de-Beauce are the big winners of the 2018 edition of Lait’xcellent, a competition that rewards milk producers across the province for the outstanding quality of their milk. The recipients were revealed at the 2019 Annual General Meeting of Les Producteurs de lait du Québec. At the Annual General Meeting (AGM) of Les Producteurs de lait du Québec (PLQ), Chair Bruno Letendre gave a speech to PLQ delegates in which he reviewed the past year, largely marked by the conclusion of the Canada-United States-Mexico Agreement (CUSMA), and discussed the prospects for the dairy industry in 2019. If 2018 was an eventful year for milk producers in political terms with the conclusion of the Comprehensive and Progressive Agreement for Trans-Pacific Partnership (CPTPP) and the Canada-United States-Mexico Agreement (CUSMA), in market terms, it was a year of adjustment. After years of outstanding growth driven by greater butterfat demand for cream and industrial milk, growth steadied but remained robust. Les Producteurs de lait du Québec convient les représentants de la presse à leur assemblée générale annuelle les mercredi 17 et jeudi 18 avril 2019 à Québec. À cette occasion, les producteurs de lait discuteront des grands sujets de l’heure et adopteront les positions qui guideront leurs actions. Rebuttal to Sylvain Charlebois’ text entitled “La doctrine laitière” (The Dairy Doctrine) published on January 10, 2019 in La Presse+. In 2018, Les Producteurs de lait du Québec donated 1,241,839 litres of milk to less fortunate families, including over 40,000 litres of milk to approximately one hundred organizations throughout the province for the Christmas season. LONGUEUIL, DECEMBER 7, 2018 – A procession of tractors travelled from the UPA’s offices to the Marriott Château Champlain Hotel in Montreal, where the meeting of Canadian and provincial premiers was being held. The tractor procession was followed by a press conference with Marcel Groleau, UPA President, Bruno Letendre, Chair of Les Producteurs de lait du Québec, and Pierre Lampron, President of Dairy Farmers of Canada. They were accompanied by the 14 regional chairs of Les Producteurs de lait du Québec. The dairy sector representatives hoped to take advantage of this meeting to remind Canada’s Prime Minister, Justin Trudeau, of his promise to compensate milk producers for the losses caused in their sector by the recent trade agreements. LONGUEUIL, November 30, 2018 – Les Producteurs de lait du Québec deplores the fact that Canada has signed the definitive USMCA text with the United States and Mexico without making amendments to the U.S. text, which includes provisions concerning oversight of Canadian dairy policies to which the Canadian government had said it would never consent. Letter from Bruno Letendre, Chair of Les Producteurs de lait du Québec, about the new agreement between United-States, Mexico and Canada for the renewal of the North American Free Trade Agreement (NAFTA). Dans le cadre des consultations publiques sur le projet de réglementation d’étiquetage sur le devant des aliments, les producteurs de lait du Québec sont préoccupés et inquiets au sujet des impacts négatifs que pourrait entraîner le projet sur la santé des Canadiennes et des Canadiens. Ferme Denis Desfossés of Sainte-Brigitte-des-Saults, Ferme Catoche of Saint-Joseph-de-Beauce, and Ferme Jolispré Holstein of Saint-Moïse are the big winners of the 2017 edition of Lait’xcellent, a competition that rewards milk producers in the province for producing outstanding quality milk. The recipients were revealed at the Annual General Meeting of Les Producteurs de lait du Québec. “When I think of the twelve last months, I see progress, positive change, but also a lot of concern for our future. Our sector’s outstanding growth has continued. In concrete terms, milk producers delivered on average over nine million litres of milk per day to the various processing plants. That is a 10% increase from 2015! I do not know many sectors that have grown so much” stated Bruno Letendre, Chair of Les Producteurs de lait du Québec, when presenting his annual review at the organization’s Annual General Meeting. AGM – NAFTA: End the concessions in supply management! Les Producteurs de lait du Québec is concerned about the future of the 5,300 family farms and the 83,000 jobs generated by milk production, as the NAFTA negotiations heat up. “The constant threat of new market concessions – which looms over our farms and our families, our financial and human investments – needs to stop. The dairy sector has been used quite enough as a bargaining chip in trade agreements. It’s time for this to end!” protested Bruno Letendre, the Chair of Les Producteurs de lait du Québec, at the Annual General Meeting. In his text entitled “À quand la gestion de l’offre 2.0?” Sylvain Charlebois pleads for a reform of supply management without telling us what that reform would look like in concrete terms. In his opinion, supply-managed products are an unprecedented opportunity to offer premium quality products to the rest of the world in the wake of the new TPP and CETA trade agreements. The only thing that’s missing is a strategy. If you read between the lines, he suggests that our resistance to change is the reason why we are not big enough, good enough or competitive enough to take advantage of the opportunity. LONGUEUIL, January 23, 2018 — “Les Producteurs de lait du Québec is extremely disappointed by Canada’s intention to sign the TPP 11, without even restoring balance to the concessions that were made in supply-managed markets. The TPP 11 should have at least taken the withdrawal of the United States from the initial agreement into consideration and readjusted the market concessions downward, since the United States alone accounted for over 60% of the GDP of the Trans-Pacific Partnership with 12 parties (TPP 12),” stated Bruno Letendre, Chair of Les Producteurs de lait du Québec. The Chair was reacting to the announcement that an agreement in principle had been concluded that maintained the market access commitments included in the original TPP of 2015. This year, Les Producteurs de lait du Québec donated 752,288 litres of milk to less fortunate families, including nearly 40,000 litres of milk through approximately one hundred organizations throughout the province for the Christmas season. 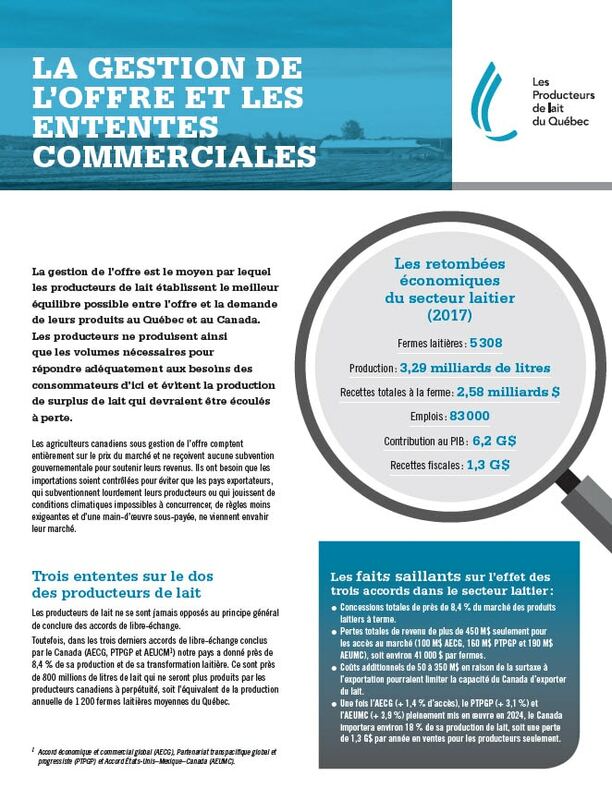 Rebuttal by Les Producteurs de lait du Québec to the piece entitled “Fermes, lactocrates et autres bureaucrates” (Farms, “Lactocrats” and Other Bureaucrats) by Alain Dubuc published in La Presse+ on October 7, 2017. This rebuttal was sent to La Presse, but has not been published. On April 18, Canada’s Ambassador to the United States, David MacNaughton,sent a letter to governors Andrew Cuomo and Scott Walker, governors of the States of New York and Wisconsin, regarding the recent statements of president Trump accusing the Canadian dairy sector of damaging US producers. Quebec City, April 12, 2017 – Ferme Denis Desfossés on Sainte-Brigitte-des-Saults, Ferme Jolichutes of Lévis and Ferme Simal of Princeville are the big winners of the 2016 edition of Lait’xcellent, a competition that rewards milk producers who stand out in the province for the excellent quality of their milk. The names of the recipients were revealed by Les Producteurs de lait du Québec at its Annual General Meeting. Quebec City, April 12, 2017 – At its Annual General Meeting, Les Producteurs de lait du Québec asked the federal government to exclude the dairy industry and supply management from the renegotiation of the North American Free Trade Agreement, just like the government at the time did in the agreement that was signed in 1994. “Last year was hard in many ways for milk producers. However, despite certain worrying issues that we face, it was also a year of incredible growth! Production entitlement rose 8% in 2016, and has increased 15% overall since December 2014; this has never happened in living memory! We are currently producing nine million litres of milk every day: That is basically a record and very good news for us as entrepreneurs! Who said that supply management was preventing growth?” rejoiced Bruno Letendre, Chair of Les Producteurs de lait du Québec, when presenting his review of the year during the organization’s Annual General Meeting. Rebuttal by Les Producteurs de lait du Québec to the piece entitled “La face cachée de la production laitière” (The Hidden Face of Milk Production) by Sylvain Charlebois, which was published by the La Presse + on March 1, 2017 and by the La Voix de l’Est on March 3. With Christmas approaching, Les Producteurs de lait du Québec has donated 39,157 litres of milk to the less fortunate, which brings the total volume of milk donated to poor families in 2016 to 741,684 litres. Quebec City, November 17, 2016 – In his address to the milk producers attending the Special Annual Meeting in Quebec City, Bruno Letendre, Chair of Les Producteurs de lait du Québec, sent a clear message to the federal government to improve its compensation program for the Comprehensive Economic Trade Agreement (CETA) between Canada and the European Union. “The amounts announced last week are definitely insufficient. Just considering the losses caused by the CETA, between 750 million and one billion dollars would be necessary to compensate producers at the same level as announced by the previous government,” stated Mr. Letendre. Quebec City, November 17, 2016 – Even with market growth and a much higher production volume, Quebec milk producers continue to face a difficult situation in terms of the price they receive for milk, despite a slight improvement compared to last year. In addition, the sector’s growth is still compromised by the Comprehensive Economic Trade Agreement (CETA), which will soon come into force, as well as lax import management. This was revealed in the 2015-2016 annual dairy market review provided today at the Special Annual Meeting of Les Producteurs de lait du Québec in Quebec City. Longueuil, le 15 novembre 2016 / CNW – Les Producteurs de lait du Québec vous avisent qu’ils tiendront leur assemblée générale spéciale le jeudi 17 novembre 2016. Compte tenu des enjeux importants auxquels les producteurs de lait font face, il s’agit d’un temps fort pour discuter des grands sujets de l’heure, brosser un bilan et réfléchir aux orientations qui guideront leurs actions. Agenda for the annual general meeting of Les Producteurs de lait du Québec which will take place on November 17, 2016 at the Hilton Hotel in Quebec city. Rebuttal – Compensating for arrogance??? Rebuttal by Les Producteurs de lait du Québec to the text entitled « Compenser l’arrogance » (Compensating for arrogance) by Sylvain Charlebois, published by La Presse + on November 6, 2016. Longueuil, October 30, 2016 – Now that Canada and the European Union (EU) have officially committed to the ratification process of the Comprehensive Economic and Trade Agreement (CETA), the Trudeau government must not delay in announcing the promised compensation program to the dairy sector. Correction by Les Producteurs de lait du Québec to the text entitled “Le lait renversé d’Alain Bourbeau” (Alain Bourbeau’s Spilt Milk) by Vincent Geloso, which was published on the Journal de Montréal’s Web site on September 7, 2016. Rebuttal by the Les Producteurs de lait du Québec to the text entitled “La gestion de l’offre appauvrit trop de Canadiens” (Impoverished by Big Dairy) by Vincent Geloso and Alexandre Moreau, published by La Presse + on September 2, 2016. Rebuttal by Les Producteurs de lait du Québec to Sylvain Charlebois’ text entitled “Filthy Ice Cream,” which was published by La Presse on July 25, 2016. This rebuttal was published by La Presse, La Tribune, Le Droit and La Voix de l’Est on July 2016. Ottawa, 2 juin 2016 — Quelque 2500 producteurs de lait de toutes les régions du Québec se sont rassemblés aujourd’hui devant la Chambre des communes avec leurs collègues d’ailleurs au Canada. Par ce rassemblement, les producteurs de lait de l’ensemble du Canada ont démontré sans équivoque l’importance de la gestion de l’offre pour l’avenir de leurs entreprises et demandé au gouvernement d’agir pour corriger les diverses lacunes de gestion des frontières qui minent l’efficacité de leur modèle depuis maintenant quelques années. Ils réclament des gestes concrets du gouvernement fédéral dans le dossier du lait diafiltré et veulent aussi obtenir la confirmation qu’il les compensera pour les dommages annuels d’environ 400 millions de dollars que leur causera à terme l’entrée en vigueur des ententes de libre-échange du Partenariat transpacifique (PTP) et de l’Accord économique et commercial global (AECG) entre le Canada et l’Union européenne. Longueuil, 27 mai 2016 — Des producteurs de lait de toutes les régions du Québec prendront la route en tracteur le lundi 30 mai pour se rendre à Ottawa. Des milliers de leurs confrères et consœurs du Québec, et d’ailleurs au Canada, se joindront à eux lors d’un rassemblement qui se tiendra le jeudi 2 juin devant la Chambre des communes. Reply of Les Producteurs de lait du Québec to the opinion « Le Bordel diafiltré » of Sylvain Charlebois, published in La Presse plus, May 6, 2016. Mont-Tremblant, April 14, 2016 – After their Annual General Meeting, Quebec’s milk producers are more determined than ever to get the Canadian government to act rapidly and enforce cheese compositional standards in the case of diafiltered milk. Transcription du discours du président des Producteurs de lait du Québec, Bruno Letendre, tel que prononcé dans le cadre de l’assemblée générale annuelle qui s’est déroulée les 13 et 14 avril 2016. Montreal, April 12, 2016 – Exasperated by the inaction of the federal government, Pierre Paradis, Quebec Minister of Agriculture, Food and Fisheries, Marcel Groleau, President of the Union des producteurs agricoles (UPA), Bruno Letendre, Chair of Les Producteurs de lait du Québec, and Serge Riendeau, President of Agropur Dairy Cooperative, have demanded that the federal government enforce cheese compositional standards. Dairy enterprises that support the demands of milk producers. Quebec City, November 26, 2015 – At their Semi-Annual General Meeting, Les Producteurs de lait du Québec gave a mixed review of the 2014-2015 dairy year. Even though the market situation is fairly positive, producers faced difficult conditions in the price they receive for their milk, trade agreements, and imports that pose a huge threat to the sector. Quebec City, November 26, 2015 – During his speech at the Semi-Annual General Meeting of Les Producteurs de lait du Québec, Chairman Bruno Letendre affirmed that he wanted to give Canada’s new government a chance to prove itself in defending supply management, especially as concerns developments in the Trans-Pacific Partnership (TPP) agreement and the Comprehensive Trade Agreement between Canada and the European Union, as well as in tightening import controls for milk protein concentrâtes. Réplique – Maxime Bernier doit s’excuser! “Producers in the supply management system understand that it is important for Canada to be part of this type of agreement. We have always acknowledged this and we hope that the gains obtained in certain sectors materialize. Nevertheless, the additional market access conceded by Canada is bad news for supply-managed commodities and pokes another hole in a system that has proven itself and largely guarantees socioeconomic development across Quebec,” stated Marcel Groleau, President of the Union des producteurs agricoles (UPA) and spokesperson for the GO5 Coalition, in response to the concessions granted by Canada in the Trans-Pacific Partnership (TPP) agreement reached today in Atlanta. With just two days to go before the Trans-Pacific Partnership (TPP) ministerial conference in Atlanta that could result in a final agreement, Quebec’s agri-food industry leaders are mobilizing and making an urgent appeal to Stephen Harper, Canada’s Prime Minister. La négociation plurilatérale de libre-échange du Partenariat transpacifique (PTP), dans laquelle le Canada est activement engagé, pourrait se conclure dès la semaine prochaine, à Atlanta. Bruno Letendre, Chair of Les Producteurs de lait du Québec (PLQ), revealed the 2014 Lait’Xcellent Award winners at its Annual General Meeting. Milk producers also honoured Ferme Clobert of Saint-Bonaventure, Quebec’s finalist for the 2014 Dairy Farmers of Canada Sustainability Award, the third time this award has been presented. At the organization’s Annual General Meeting, Bruno Letendre, Chair of Les Producteurs de lait du Québec, directed comments at the Canadian government in connection with the Trans-Pacific Partnership (TPP) negotiations, which may end this spring. Transcription of the allocution of Bruno Letendre, Chairman of Les Producteurs de lait du Québec, as adressed during the Annual General Meeting of April 15, 2015. At its Annual General Meeting today, Les Producteurs de lait du Québec gave a positive review of market conditions in the dairy sector in 2014. Les Producteurs de lait du Québec gave a positive assessment of collective marketing in the dairy sector, as part of a review of the 2009-2013 period before the Régie des marchés agricoles et alimentaires du Québec (RMAAQ). Mémoire des Producteurs de lait du Québec présenté à la Régie des marchés agricoles et alimentaires du Québec pour l’évaluation périodique du plan conjoint des Producteurs de lait du Québec. Cheaper pizza thanks to free trade with Europe? Nothing could be further from the truth! Rebuttal by Les Producteurs de lait du Québec to Sylvain Charlebois’ text entitled “La pizza moins chère grâce à l’Europe” (Cheaper pizza thanks to Europe? ), which was published in La Presse on Friday, January 23, 2015. This holiday season, Les Producteurs de lait du Québec has donated nearly 38,000 additional litres of milk to the less fortunate, in addition to the record-breaking volume of 1,279,289 litres of milk already donated to underprivileged families in 2014, as part of the dairy industry partners’ milk and dairy donation program. Transcription of the allocution of Bruno Letendre, Chairman of Les Producteurs de lait du Québec, as adressed during the Special General Meeting of November 27, 2014. At the Special General Meeting of Les Producteurs de lait du Québec, Chairman Bruno Letendre demanded tangible, firm support from governments to maintain the essential conditions for supply management, especially in view of the Trans-Pacific Partnership free trade negotiations. He urged the governments not to give in to the demands of Canada’s trading partners, which are a double standard, as all countries have sensitive sectors to protect. At the Special General Meeting of Les producteurs de lait du Québec, Chairman Bruno Letendre was pleased to present Zakary O. Rhissa, Executive Director of Food Banks of Quebec, with $15,000. At the Special General Meeting of Les producteurs de lait du Québec, Chairman Bruno Letendre unveiled the organization’s new logo. Rebutal by Alain Bourbeau, General Manager, FPLQ, to Alain Dubuc’s column – La Presse? Que l’Europe se montre aussi ouverte que nous le sommes déja avant de réclamer plus d’acces a notre marché!? Semi-annual General Meeting of the Fédération des producteurs de lait du Québec? The Fédération des producteurs de lait du Québec offers 41 000 litres of milk to the least fortunate for Christmas?